Nannyberry Viburnum Bush is a highly versatile, appealing and easy to grow shrub. It requires very little care but offers a lot of colors and year-round display.The plant will flower in May. Its flowers are a pretty white color and come in clusters. The shrub produces an abundance of flowers, so expect quite a site in the spring time. Its flowers will also attract butterflies, bees, and other pollinating animals. During the fall, the leaves of the shrub will begin to turn a deep red color. The plant will even show off during the winter time as well. That is when it will produce its berries which are edible. Eat them yourself, make jam from them and watch the birds that will come to eat them. It makes a great addition to any garden because of their numerous, showy flowers in the spring and bold red foliage during the autumn. They are a great addition to native plant gardens, as they are native to many parts. Nannyberry Viburnum Bush multiplies quickly and spreads through its roots. These characteristics make it a natural hedge shrub. Plant them where you want to create a natural hedge in your garden. You can also use it to create a privacy screen as the foliage is quite lush and thick. 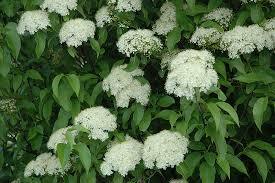 Nannyberry - Viburnum Lentago produces small, white flowers in flat-topped clusters in late spring. Their edible fruit has a bluish-black color in drooping bunches. The fall foliage color is red, and the lower branches root where they touch the ground. Viburnum Lentago can be used as a background or screen plant. Nannyberry Viburnum Bush is shade tolerant, so it is great to plant under much bigger trees for a touch of color. 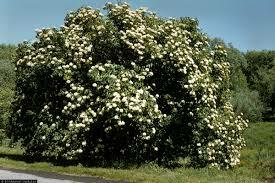 They are also great to use in shrub borders, as a tall barrier, and it is also great to plant in groups as a windbreak. This Viburnum Lentago shrub is an excellent addition to your flowerbed with its magnificent colors that it will provide. Nannyberry will give you lovely white blooms during spring and summer and gorgeous red leaves during the autumn.